Join us in making Austin a greener, cooler place where children and adults have daily access to nature. We invite you to grow a pollinator garden, plant a tree, and commit to bringing more nature into your life every day. Nature in the City is a collaboration between multiple City of Austin programs and partner organizations working together to increase our community's access to nature. Hornsby Bend's Kevin Anderson presents Austin Nature in the City. The City of Austin is a proud member of the Biophilic Cities Network, which helps the City bring new research, tools, and ideas from around the globe to our community here in Austin. Organizations, institutions, and individuals are all invited to join the network and make the commitment to bringing more nature into our lives. Nature in the City is sponsored by the Community Tree Preservation Division and part of the Development Services family. 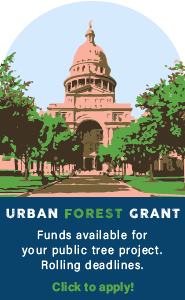 This community focused, nature-based initiative helps implement Imagine Austin and Austin’s Urban Forest Plan.